Lead is the commonest metal involved in chronic poisoning. Lead is the commonest metal involved in chronic poisoning. It was one of the first metals known to man and has been widely used during the last two thousand years for domestic, indus-trial, and therapeutic purposes. Lead is abundant in soil, being distributed throughout the earth’s crust. 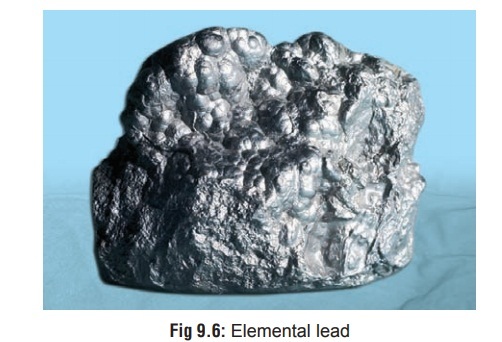 Elemental lead exists as a highly lustrous, heavy, silvery-grey metal (Fig 9.6) with a cubic crystal structure that assumes a bluish tint as it tarnishes in air. The various situations in which lead salts are used resulting in chronic occupational, environmental, or domesic exposure are listed in Table 9.5. · Renovation/modernisation of old homes. split between ingestion and inhalation exposure routes. About 5–15% of ingested lead is absorbed by adults with less than 5% retained. Children, however, absorb approximately 50% of ingested lead and retain about 30%. This is not really relevant to lead since acute poisoning is very rare. The average lethal dose is said to be 10 gm/70 kg for most lead salts, while it is 100 mg/kg for tetraethyl lead. · Lead is absorbed through all portals of entry. Occupational exposure results mainly from inhalation, while in most other situations the mode of intake is ingestion. Tetraethyl lead can be absorbed rapidly through intact skin. · Following absorption, it is stored in the bones as phosphate and carbonate. In children about 70% of total body lead is skeletal, while in adults over 95% is in osseous tissues. Lead is drawn to those areas of the skeleton which are growing most rapidly. These include the radius, tibia, and femur, which are the most metabolically active. The hyperminer- alisation is reflected in the form of densities which are the classic “lead lines” observed on x-ray (Fig 9.9). o The width of the lead lines is related to the duration of exposure. o Significant amounts of skeletal lead are released from bone into the blood stream periodically resulting in symptoms of toxicity. The conditions favouring this include acidosis, fevers, alcoholic intake, and even exposure to sunlight. · Absorbed lead which is not retained in the body is excreted primarily in the urine (about 65%) and bile (about 35%). · Lead combines with sulfhydryl enzymes leading to interference with their action. · It decreases haeme synthesis by inactivating the enzymes involved such as aminolaevulinic acid dehydrase,aminolaevulinic acid synthetase, coproporphyrinogen oxidase (or decarboxylase), and ferrochelatase. This resultsin anaemia. · Lead increases haemolysis as a result of which immature red cells are released into circulation such as reticulocytes and basophilic stippled cells (the result of aggregation of ribonucleic acid due to inhibition of the enzyme pyrimidine-5-nucleotidase which normally eliminates degraded RNA) (Fig 9.10). · In the CNS, lead causes oedema and has a direct cytotoxic effect leading to decreased nerve conduction, increased psychomotor activity, lower IQ, and behavioural/learning disorders. Children are especially susceptible. The highest brain concentrations of lead are found in hippocampus, cerebellum, cerebral cortex, and medulla. · Lead also has deleterious effects on the CVS (hypertension and myocarditis), kidney (nephritis),* and reproductive organs (infertility). Lead nephropathy after chronic lead exposure has been well described. Interstitial nephritis, reduced glomerular filtration rate, and nonspecific proximal tubular dysfunction are typical. In addition, lead can decrease uric acid renal excretion, thereby raising blood urate levels and predisposing to gout (saturnine gout). Elevated urinary levels of N-acetyl-3-D-glucosaminidase and beta-2-microglobulin may serve as early markers of renal injury. · There is much controversy over this at the present time. Lead appears as a trace metal in virtually all foods and beverages, though fortunately absorption from such sources is relatively low. · Adults ingest 300 mcg and inhale 15 mcg of lead approximately each day, of which only 10% is absorbed, but children may absorb upto 50%. · An important source of food based lead poisoning is the use of lead-soldered canned food and drink. While in USA measures have been taken to ban lead soldering of cans, the Indian canned food industry may still be persisting with lead soldered seams, though there is no clear information on this. · Lead in drinking water may be absorbed to greater extent than that in food. The concentration of lead which may not really be very high in ground or surface water may progressively rise as it passes through the distribu-tion system because of contact with lead connectors, lead service lines or pipes, lead soldered joints, lead containing coolers, and lead impregnated fixtures such as brass taps. · Because of the reasons mentioned, minute quanti-ties of lead are always present in the blood of even normal individuals. Only when the concentration is high, do features of intoxication begin to manifest. Today the accepted upper level for blood lead (BL) is fixed as 35 mcg/100 ml. However there are reports that adverse effects especially on the haematopoietic system can occur at levels as low as 10 mcg/100 ml. Neurobehavioural disorders in children can occur at BL as low as 25 mcg/100 ml. Hence, the current trend is to consider even levels as low as 10 mcg/100 ml as unacceptable, especially in children. · This is rare. Many reported cases of acute poisoning may actually be exacerbations of chronic lead poisoning when significant quantities of lead are suddenly released into the bloodstream from bone. · Symptoms include metallic taste, abdominal pain, constipation or diarrhoea (stools may be blackish due to lead sulfide), vomiting, hyperactivity or lethargy, ataxia, behavioural changes, convulsions, and coma. · Lead palsy: wrist drop (Fig 9.11) or foot drop. · Lead colic: intermittent severe abdominal cramps. There may be tenderness around the umbilicus. · Lead encephalopathy: It is more common in children and is often associated with organic lead toxicity, especially tetraethyl lead or TEL which is lipid soluble and is distributed widely in lipophilic tissues such as the brain. TEL is metabolised to triethyl lead which is the major toxic compound. There is sudden onset of vomiting, irritability, headache, ataxia, vertigo, convulsions, psychotic manifestations, coma, and death. Mortality rate is around 25%. Even if recovery occurs, there is often permanent brain damage manifesting as mental retardation, cerebral palsy, optic neuropathy, hyper-kinesis, and periodic convulsions. ■■ Facial pallor, especially circumoral is said to be a char-acteristic feature of chronic lead poisoning and is due to vasospasm, though anaemia may contribute to a significant extent. ■■ The anaemia that is encountered in plumbism is similar to that due to iron deficiency, i.e. it is hypochromic and microcytic in type; but anaemia due to the latter is neither associated with reticulocytosis, nor are basophilic stippled cells seen. Anaemia is not a prominent feature in organic lead poisoning. Basophilic stippled cells are also not commonly encountered. ■■ Increasing blood lead levels in children have been corre-lated with hearing impairment, developmental delay, aggressive, hyperactive and antisocial behaviour, visual problems, and growth retardation. ■■ Lead is transferred across the placenta. It can affect reproduction in males and females, and affects neurode-velopmental milestones in children with both prenatal and postnatal exposure. Lead poisoning during pregnancy has been associated with prematurity, low birth weight, and impaired foetal growth. ■■ Lead is increasingly being implicated as a carcinogen. Some lead salts have produced tumours in experimental animal studies.